As you know, my dear reader who I shall call Ricardo, I love lippies. I am into red shades now (thanks, Taylor Swift) because they give an illusion that I am wearing complete make-up when I am really not. Also, red lipsticks look banging on me – not to brag and all. 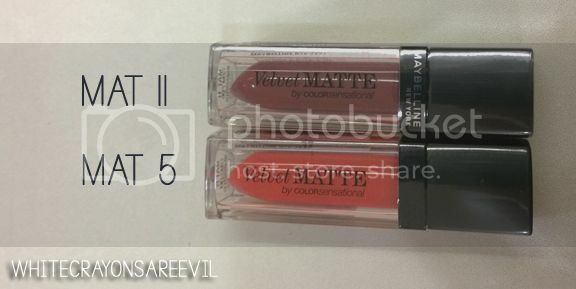 Maybelline released a new line of cream-to-matte lipstick, the Velvet Matte by ColorSensational which they are selling for less as introductory price (P299, from almost P350 I think). Of course, being the thrifty me, I grabbed the chance and bought two! I chose Matt 5 (coral) and Matt 11 (red). My most favorite thing about these babies are the colors. Matt 5 has this coral, orange-y shade, perfect for events that require modesty and simplicity. I like this color since it matches my fair complexion/warm skin tone very well. I feel/look like a little ray of sunshine wearing this – not to brag and all. However, it would take me about two or three layers to achieve the color intensity I like. As much as I like Matt 5, I LOVEEEEEEEE Matt 11 more. Like infinity times more. Well, I might be biased since I am into red lippies now (thanks, Taylor). Its redness is deeper than Nyx Matt Red, but lighter than Avon’s Reviving Red. It’s on the darker side of red. A single layer is enough for me, color is intense and is ab-so-lut-ly gorgeous. STUNNING! The Velvet Matte does not feel matte, but does not feel glossy neither. They’re like… ‘moisturized matte’. I hate the feeling of glossy lippies, but I am not particularly bothered with the texture of Velvet Matte. Although it does not feel matte, it looks matte, which is a plus one for me. it take moments before the cream settles in your lips, so patience, my love. I don’t know if I am not using the lippies right, but there’s not much staying power. I’m quite disappointed, because I adore everything else about these babies. I would usually put on my lippies at around 10am, and Maybelline Velvet Matte stayed on until 1pm, but with less intensity on it’s color (and after carefully drinking my morning coffee and tons of water). I was ok with Matt 11 since it still has that red tint, but Matt 5 made me feel naked, and not in a good way. The color’s completely gone after lunch. Also, stains. Stains everywhere. It’s worse than my matte Nyx. So there, I love the texture and colors of the Maybelline Velvet Matte, but the staying power and messy stains are big cons. 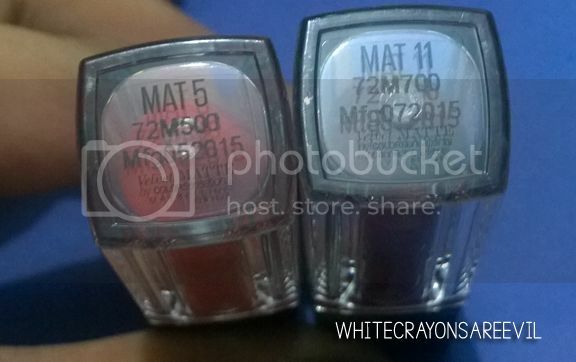 Edited on November 16, 2015: I bought another shade. Read more here.